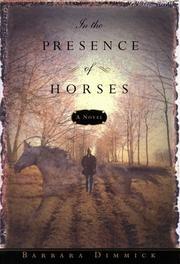 A first novel about a woman who loves horses but finds humans a tougher challenge is more of a bumpy trot than an exhilarating gallop—despite some convincingly rendered settings. Ever since Natalie Baxter’s father died of cancer, her sister Lucy of a drug overdose, and her favorite Aunt Vee of suicide, Natalie’s been running away from home (Bethlehem, Pennsylvania) and commitment. An accomplished rider, she has traveled the country working at stables but has forced herself to move on whenever she felt herself developing any emotional ties. Now in her late 30s, she’s back in Pennsylvania—against her better judgment. Thirtyish communications teacher Pierce Kreitzer wants her to fulfil his dead sister Allie’s dying request to take care of the horses (especially a black one called Twister) and teach riding. The farm and the horses have been neglected as Pierce—a photographer by vocation, still grieving over Allie’s death’spends hours in his darkroom. While Natalie cleans the place up and rides the horses, she finds herself drawn to Twister, but he’s got a deformed foot and soon has to be put down by the local vet. This means more grief for Natalie, though she’s growing attached to the other horses and to her pupils. Pierce, however, remains an enigma, and when Natalie discovers a cache of photos he secretly took of her, she flees to Bethlehem, fearing that he’s in love with her—or worse. There, finally, she revisits her family’s history and learns the truth about her aunt’s death. Ghosts laid to rest, she heads back to Pierce’s farm—only to find a horrible reprise of her past. Granted that horses are “hot,” but there’s something unbalanced about a story in which the four-footed characters have more personality than the two-footed ones on top of them.